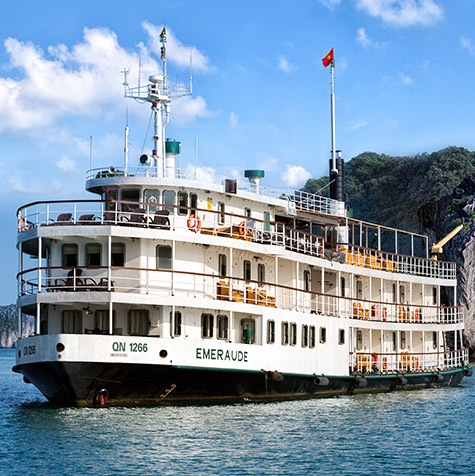 Emeraude Classic Cruises offers guests a value-packed, premium experience in Halong Bay starting with the ship itself. Limited to just 80 passengers, the ship is modeled after a turn-of-the-century paddle steamer and evokes a time when travel was synonymous with style and leisure. From our vintage décor paired with state-of-the-art navigational and safety systems to our freshly-made crêpes on the Sundeck and elegant seafood BBQs – everything about the Emeraude is designed to make your Halong Bay cruise the safest, most stylish and memorable cruise experience possible. The Emeraude was famously the setting for an episode of "Anthony Bourdain: Parts Unknown" where the acclaimed host noted the ship had "all the modern conveniences, all the charms of the past". See the highlights of Halong Bay on this classic itinerary featuring cave and beach excursions, visit to a floating pearl farm with the opportunity to kayak as well as a range of family-friendly, on-board activities. 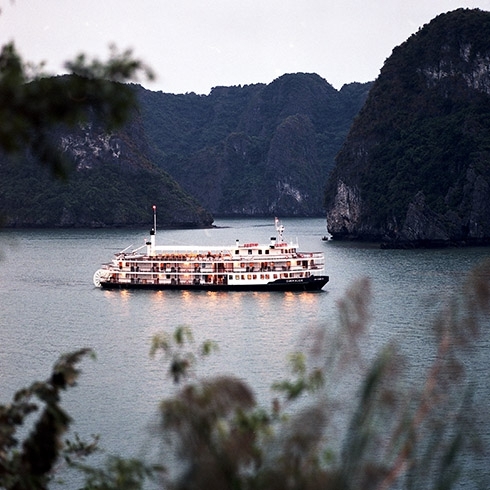 Experience more of all that magical Halong Bay has to offer on an extended 3-day / 2-night cruise. In addition to the classic highlights including cave and beach excursions, visiting a floating pearl farm with the opportunity to kayak as well as a range of family-friendly activities aboard the Emeraude, spend a second day aboard a day cruiser visiting three additional islands where hidden mountain lakes, shimmering caves and cheeky monkey troops await. From corporate functions and retreats to weddings, birthdays and special celebrations, let us tailor the perfect cruise event for you, including sightseeing, activities and delectable menus. You supply the guests. We’ll do the rest. 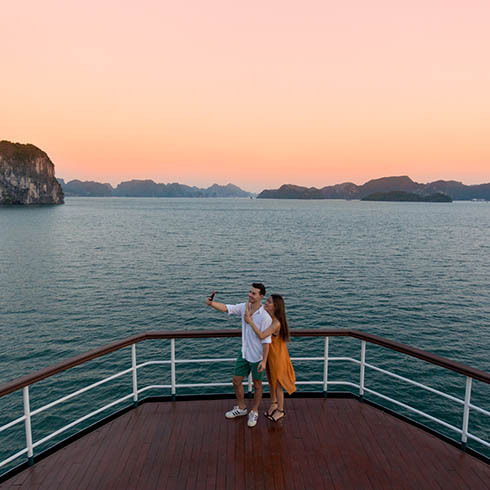 A classic journey for the always magnificent Halong Bay: Emeraude Classic Cruises bring you cave and beach excursions, a visit to pearl farm with the opportunity to kayak and more on-board activities. 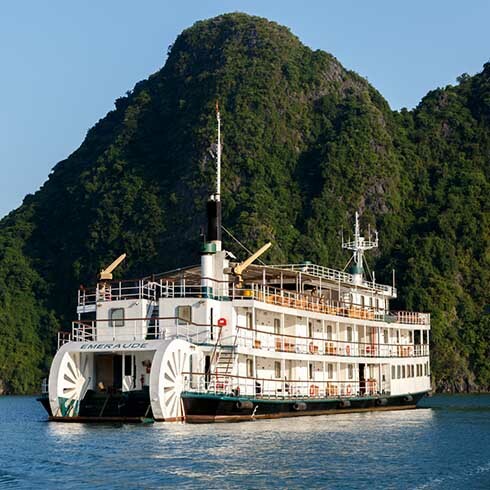 Explore Halong Bay in style with your family on this luxe vintage vessel! Modeled after a vintage paddle steamer, the Emeraude exudes sophistication with one of the largest sundecks on the bay. Our buffet are simply the best in the bay, featuring a stunning seafood BBQ coupled with East-Meets-West fusion food. The Emeraude boasts a solid steel hull for a smooth, comfortable cruising experience with state-of-the-art navigation. Do as much or as little as you like, from kayaking, cooking demonstrations, to excursions and more. This was one of the highlights of our visit to Vietnam. The Emeraude is far from a young girl but has loads of oldy worldy charm and grace. She was once a paddle steamer in a past life. The accommodation is fitted out very nicely and was complete with efficient air conditioning. They have managed to retain the old fashioned feel of the boat. The crew were very welcoming and could not do enough for you throughout the entire voyage. All our meals were of a very high standard and there was a lot of choice was on offer. The overnight accommodation was excellent and provided a very comfortable and refreshing stay throughout. All in all a brilliant experience.